What makes great business presentation software? The best presentation tools are great because they’re easy to use, offer sometimes surprising functionality and deliver a great final result. There’s more than one way to make, store, access, control and display a presentation. The best business presentation tools of 2017 do more than mimic a whiteboard. They integrate with other tools, offer remote access and customizable templates, and much more. The final presentation is the test of a tool’s worth. But it’s not just a question of what looks ‘best’ – some users might benefit from embedded video, dynamic slides or animated graphics. Others might need the sparest, simplest tool they can find. So we’ve selected tools that excel in all kinds of different ways. The greatest performance in the world is only as good as it is accessible: if you can’t use it, it’s no good to you. So we’ve looked at how easy it is to use the tools we rate too. So, based on those criteria, what are the best business presentation tools for 2017? HaikuDeck is a visuals-oriented tool that lets you build and display slides using 40 million of their images – or your own. There are 6 readymade presentation themes so you can plug and play, with extensive customization available too. It’s web based and stores its data in the cloud, so it’s pretty much device agnostic and you can build your presentation in the office on desktop and display it on tablet in another building if you need to. HaikuDeck looks pretty good! It’s strongly oriented toward visuals, but that’s one of the strong points of a good presentation anyway. If you’re filling your slides with text, you’re doing it wrong. The control over HaikuDeck’s appearance means you can create the presentation you want. HaikuDeck is easy to use even if you have limited design skills. It’s designed so that you can create visually impressive presentations without doing much more than dragging and dropping, but you have extensive customization options if you want them. Rather than have to download, translate, and move files around you can simply drop them into a SlideDog playlist – as is – and then play from beginning to end. And you can display your SlideDog presentation on one computer while controlling it with another, or share it to multiple computers simultaneously so you can pass it to your audience in real time and use their screens for your display. Live polls and quizzes can also be added to the SlideDog playlist, and is answered by the audience from their tablets or smart phones. SlideDog looks good because it lets you look good: it lets you switch between a website and a presentation – without switching. It lets you use the graphics you want, and it lets you take a simple presentation and take it where you need to. SlideDog is designed around a drag and drop interface that makes it extremely easy to use. Why not give it a try and download the latest version of SlideDog for free? Prezi is designed to be as nonlinear and flowing as possible. If staid presentation tools are about standing at the front of the room and telling people things, moving from page one to page nine, Prezi allows a form of interaction that’s more like a conversation. That can be a bad thing: if you’re not good at organizing your thoughts Prezi won’t help you get clear and simple. If what you have to talk about is complex and nonlinear, though, Prezi is ideal. Prezi looks great. It lets you make presentations that really flow, allowing a control over what the audience sees that’s almost cinematic. Prezi is more difficult to get good results from than some of the other tools on our list: it requires some skill to get the best from it. But there are ready-made slide templates, a drag-and-drop system for adding content and several ‘paths’ preset to allow you to get started immediately. Glisser is one of the most feature-packed, versatile pieces of business presentation software out there. When you’re building presentations, Glisser stands with the best in field. But it’s when you’re making your presentation that Glisser shines. It lets your audience ask questions and offer feedback from their own devices while the presentation is showing, and provides significant analytics and data crunching too, allowing you to optimise your presentations based on audience feedback. Glisser presentations look like website design, rather than like traditional words-on-a-slide presentations. Glisser lets you use white labelling – adding your own labelling to Glisser presentations. 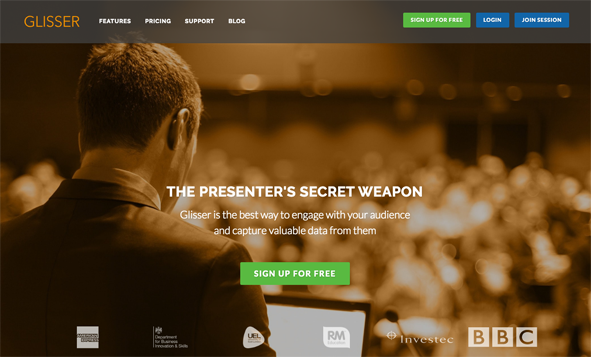 Glisser isn’t difficult to build presentations with. Using the feedback and analytics tools that really make it stand out, though, requires some careful preparation, and you’ll have to explain it to your audience too. Slidebean is web-based business presentation software that focusses on startup and sales business use cases. The tool is designed to be easy to use for investor and pitch decks. Slidebean lets you add content and automatically convert it to a completed presentation, and there’s limited analytics too. Standard Slidebean slides looks like what you’d get if you had a designer make your PowerPoint slides: there’s nothing really unusual there, but they look stylish and presentable. Easy pre laid tracks for content, presentation structure and appearance customization make Slidebean a winner in ease of use. When you’re choosing the best business presentation software, you need to remember that your mileage may vary: you need the tool that delivers what you need, and in a way that you can get the best out of it. We’re confident that the best tool for you is in this list of world-beaters, though – scope them out and go into your next presentation ready to deliver something truly spectacular!